My recent trip to Oregon would not have been complete without visiting one of my favorite places in the WHOLE entire world...The Oregon Coast! There is just something about the cold waves of the Pacific, the rocky tide pools, and the washed up kelp that makes this place one of my favorite destinations. ***The picture above was taken in Lincoln City right behind The Sandcastle Motel (a place we would stay when I was a kid). Although I never did get a black belt in Karate I think I could give Jackie Chan a run for his money! We drove along the coast and hit some of my favorite towns including Depot Bay the world's smallest harbor. Tourists around the world flock to Depot Bay to check out their famous Gray Whales. These whales have been visiting this place for generations and can be seen at the town's Whale Watching Center. ***Here I'm pictured with the town's mascot! Our next stop on our adventure down the coast was to Newport's famous Historic Bay Front. 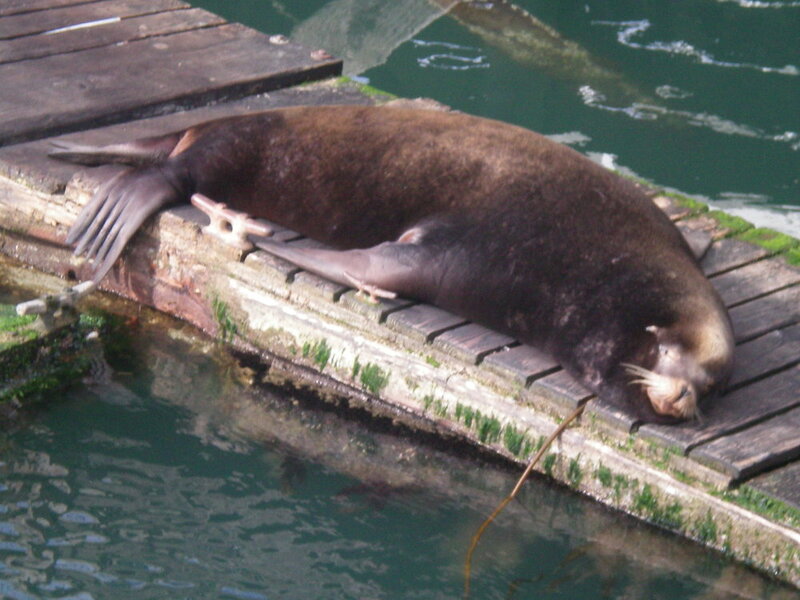 Of course my favorite attraction is the wild California Sea Lions that plop themselves up on docks and bask in the summer sun. I felt pretty lucky to even see two of these marine mammals. The majority have migrated to California to meet with the breeding females. ***I guess we could label this guy as a content bachelor! Ok...I know it's a little rough on the outside but the Dock of the Bay Marina located in Waldport, Oregon is my number one stop when I visit the coast. This small little "hole in the wall" is situated right on Alsea Bay which offers some of the best crabbing around. Although I do not eat crabs they sure are fun to catch! My trip to the Oregon Coast was absolutely amazing. Every time I visit this peaceful place I always come back with new experiences and memories that will last a lifetime. Fun Facts about the Komodo!